On this day in 1786, Frederick II's reign of more than four decades finally came to an end. Better known as Frederick the Great, he is remembered now for his military victories and a monarchy that placed Prussia in the vanguard of European nations. On 17th August, the 74 year old king retired to his study in the palace of Sanssouci in Potsdam. Here he settled in an armchair and passed quietly away. 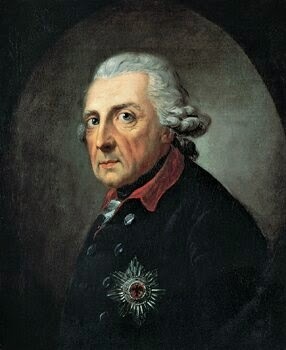 He left no children to take his place and was succeeded as King of Prussia and Elector of Brandenburg by his nephew, Frederick William II. However, if in life Frederick had been a man used to getting his own way, in death things were to change. He had always expressed a wish to be laid to rest beside his adored Italian greyhounds on the terrace at Sanssouci. However, Frederick William II decided that a more appropriate resting place would be a formal tomb within the Potsdam Garrison Church. Here Frederick was destined to lay until World War II, when his remains were spirited away to a hidden location; discovered at the close of the war, they were reburied in Marburg. However, Frederick's travels were far from over and in 1953 he moved again, this time to Hohenzollern Castle, where he was interred until 1991. Finally, two hundred and five years after Frederick's death, his mortal remains were returned to Sanssoucci where they were placed in state with a full guard of honour. That evening his casket was taken out to the vineyard terrace and Frederick the Great was laid to rest in the plot of his own choosing, his wishes finally fulfilled. I've been to the Hohenzollern Shloss when I lived in nearby Stuttgart. I didn't realise taht Frederick was interred there. I would have said hello. I'm not being smart alecky. I still feel I had a personal introduction to Elizabeth I, Mary Queen of Scots and Mary Tudor after being next to their tombs in Westminster Abbey. If you're ever in Sanssoucci, pop by and wish him good day! He is with the greyhounds; I saw them at Sanssouci. I'm glad he got his wish, even if it took centuries! At Hohenzollern Castle his coffin was standing in the protestant Christus Chapel of the Castle where also the coffin with the remains of his father was placed. No there is a special Plaquette where the coffin have been. Its good that he finally got back to his beloved dogs instead of his burial place being a political football. A happy ending of sorts! I remember a statue of him at Hollenzollern.